After the unsettlingly poor ‘Quantum of Solace’ in 2008, fans found little solace of their own in the prospect of another dud for superspy James Bond. Four years on, ‘Skyfall’ picks up the torch and redeems a franchise that always seems one film away from wearing out its welcome. Sam Mendes (‘American Beauty’) takes the director’s chair this time; his ‘lightly, lightly’ approach to direction and cinematography give Skyfall a more genteel touch than you might expect. This kind of emotional sophistication and depth legitimizes not only James Bond as a character of nuance and humanity, but the entire franchise too. A lot of critics are claiming this to be the best Bond film ever made; they may well be right—to some degree. It’s certainly the most poignant—which, in what is ostensibly an action film, is a feather in Mendes’ cap to be sure. It also helps that the cast is supremely talented – and given decent material to work with for a change. Daniel Craig is unquestionably the toughest Bond we’ve seen. He has a killer’s eyes, making me wonder what skeletons Craig is hiding in his wardrobe. However, the hardened exterior means his impact is all the greater when he displays his vulnerabilities. After all, what good is a hero with no flaws? 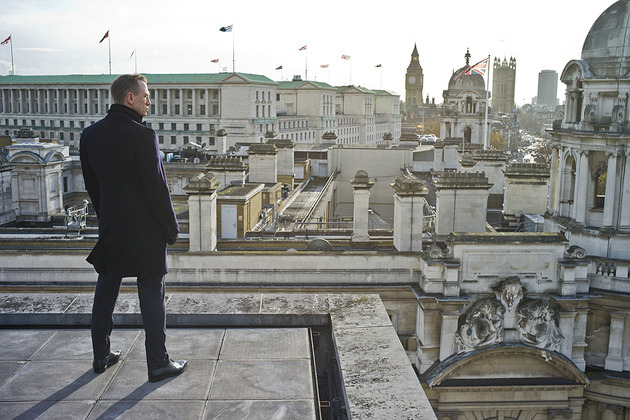 Bond fights for Queen and country in ‘Skyfall’. He also has a commanding presence on camera. Mendes captures Craig’s subtlety very nicely. One of the most perfectly articulated ‘Bond’ moments is actually in the trailer – where Bond leaps into a rapidly crumbling train carriage with just enough bravado to adjust himself and stroll into the next car as if nothing had happened. That’s the Bond we all want. That’s the hero we cheer for—and the character Mendes captured. A villain worth fearing is also a must –and Javier Bardem, for whom the role was written – is excellent (if very ‘Joker’-esque) as Raoul Silva. Bardem has an understated menace in most roles he tackles – from the standout, perhaps breakthrough performance in ‘No Country For Old Men’ through to Skyfall. His character shares some similarities with the Coen Bros.’ seminal film; the smiling villain is always the most unpredictable one. This was a lesson that Christopher Nolan learned (or taught) in ‘The Dark Knight’ – and Skyfall actually shares some tonal (and perhaps plot) similarities. In some ways, it makes for a familiar film. There are twists – and you might pick them by the end, but largely the story location-hops with the best of the Bond films. 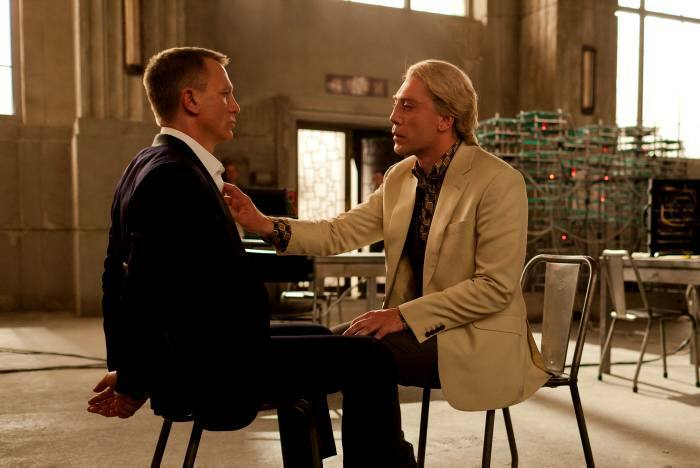 The real thorn in Skyfall’s paw is the bloated supporting cast. Javier Bardem gets all up in Daniel Craig’s personal space. There is absolutely nothing wrong with Dame Judi Dench as Bond’s superior, M. Sympathetic, motherly, impactful and commanding. Then there are the ‘Bond girls’ who, despite the best and most ardent marketing spin campaigns, still remain superfluous eye candy. French model and actress Bérénice Marlohe is relegated to a meaningless part that is wedged in the centre of the film. There’s precious little screen time, despite attempts to flesh out her backstory. Naomie Harris, who plays a support agent at MI6, fares a little better – but it’s hard to shake the feeling she was shoehorned into the story in a later edit to justify some plot progression elements. Still, those are the biggest gripes – and that’s not bad at all. Skyfall does remarkably well at giving James Bond empathetic legitimacy. Considering he’s a trained killer, that’s no mean feat for Craig and Mendez. Whether this is the best James Bond yet is hard to say – it’s certainly up there in the highest echelons. That said, when ‘James Bond will return’ flashes on the screen during the credits, it’s nice that there’s a permeating feeling of anticipation and relief this time around. Great film, excellent review. It looked and sounded amazing.